Vietnamese grow rice at any place where the conditions are suitable for rice plant to grow and produce. Therefore, rice fields in Vietnam are very diverse. During the early years in the history, the majority of rice fields were upland rice fields. Gradually with technological development, farmers developed rainfed lowland rice fields, irrigated rice fields, and other rice fields. Similarly, at beginning, Vietnamese grew one rice crop on a pieces of land in one year. Gradually with technological development Vietnam farmers grew two to three rice crops on the same pieces of land in one year where water is available. The following pages briefly present the development on rice fields and rice seasons in Vietnam. Vietnamese, therefore, plant rice wherever land is suitable for rice plant to grow, develop and produce. During the country’s history, rice land/fields in Vietnam have increased through both the expansion of country territory as well as through the efforts on land reclamation and improvement. Subsequently the agricultural land and rice land area increased with time. Between 1868 and 1873, Vietnamese had about 600,000-700,000 hectares of rice land (Trần Văn Đạt, 2002). In 1912, the Southern Vietnam or Cochichine had about 1,500,000 hectares of rice land, while the rice harvested areas in Red River Delta in 1912 were 776,700 ha of Mua rice and 475,000 ha of Chiem rice (Bulletin economique de l’ Indochine, 1912). The Bulletin economique de l’ Indochine in 1912 also reported that the Southern Vietnam in 1912 had (a) 760,000 hectares of first class rice land with average rice yield of about 1,400 kg/ha; (b) 305,000 hectares of second class rice land; and (c) 417,000 hectares of third class rice land. Table 1 shows the agricultural and rice land in Vietnam during the 1993-2002 period. In 1993, Vietnam had about 7.34 million hectares of agricultural land, of which 4.25 million hectares were rice land. During the 1993-2000 period, the agricultural land increased steadily to about 9.34 million hectares, while the rice land fluctuated 4.38 to 4.19 million hectares. In 2002, rice land area decreased to about 4.06 million ha while agricultural land increased to 9.40 million ha. * Rice land is the physical land area on to which rice is grown. In Vietnam, on a rice land, one could grow one, two or even three crops of rice in a year depending on water availability. Rice land area, therefore, is different to the rice harvested area. For example in 2002 there were 4.061 million hectares of rice land, but the rice harvested area was 7.504 million hectares. 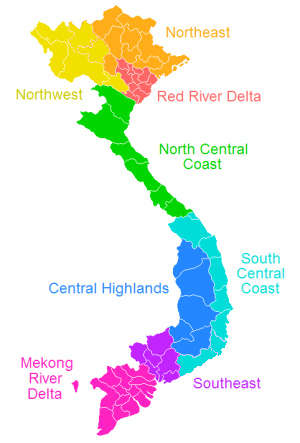 After 1975, Vietnam had 7 administrative regions namely (a) the Northern Mountains and Midlands (NMM), (b) the Red River Delta (RRD), (c) the North Central Coast (NCC), (d) the South Central Coast (SCC), (e) the Central Highlands (CHL), (f) the Southeastern Region (SER), and (g) the Mekong River Delta (MRD). In 2002, the NMM region was divided into Northeast and Northwest regions. Figure 1 shows the 8 different administrative regions of Vietnam at present. In 1995, there were about 578,440 hectares of rice land in the Northern Mountains and Midlands, about 577,899 hectares of rice land in the Red River Delta, about 414, 383 hectares of rice land in North Central Coast, about 273,027 hectares of rice land in South Central Coast, about 131,166 hectares of rice land in Central Highlands, about 277,732 hectares of rice land in Southeastern Region, and about 1,950,884 hectares of rice land in Mekong River Delta (GSO, 1995). Vietnamese plant rice where land is suitable for rice production. Therefore, in Vietnam as in other countries in Asia, rice fields and their conditions are highly variable or there are different types of rice fields. In 1982 a group of rice experts met at the International Rice Research Institute in Los Banos, Philippines and they grouped different rice fields in the world into 5 types namely upland, rainfed lowland, irrigated, deep water and tidal wetland rice fields. 2.1 Upland Rice Fields: In Vietnamese upland rice fields include ruộng lúa cạn, ruộng lúa nương, and ruộng lúa rẫy. The Directorate of Agriculture of the Republic of (South) Vietnam reported in 1972 that about 70,397 ha of upland rice in the provinces from Quảng Trị to Long Khánh in 1970. In 1995, Arraudeau and Vo Tong Xuan reported that South Vietnam had about 450,000 hectares of upland rice and in 1997 Huke and Huke reported about 420,000 hectares of upland rice in 17 provinces namely Hà Tuyên, Lạng Sơn, Lai Châu, Vĩnh Phú, Quảng Ninh, Hà Sơn Bình, Thanh Hoá, Nghệ Tĩnh, Bình Trị Thiên, Quảng Nam, Nghĩa Bình, Phú Khánh, Thuận Hải, Gia Lai- Kontum, Đắc Lắc, Lâm Đồng, and Đồng Nai. The harvested area of upland rice had reduced substantially and the Government General Statistics reported that in 2000 there were only 200,000 hectares of upland rice in the whole Vietnam (GSO,2000). 2.2 Rainfed Lowland Rice Fields: In Vietnamese rainfed lowland rice fields are ruộng lúa nước không có tưới tiêu, where water for rice production is depended mainly on rainfall. Rainfed lowland rice fields are usually bunded to keep a layer of water, which is normally about 25 cm deep or less during the rice cropping season. In 1995, Vo Tong Xuan reported that the Mekong River Delta has about 600,000 hectares of rainfed lowland rice, especially in the provinces that run along the coastal area. In 1997, Huke and Huke reported that Vietnam had about 1.207 millions hectares of rainfed lowland rice. In 2005, UNEP reported that in 2001, the combined harvested area of upland and rainfed lowland rice in Vietnam was about 11% of the 7.485 million hectares of the country’s rice harvested area or about 823,000 hectares (Table 2). 2.3 Irrigated Rice Fields: In Vietnamese irrigated rice fields are ruộng lúa có nước tưới tiêu where rice production is assured of water that is supplied with irrigation systems and rainfall. The water layer on the rice field is normally about 15 cm or less. Fields of irrigated lowland rice are never dry. In 2001 the harvested area from irrigated rice in Vietnam was about 89% of the 7.485 million hectares of total rice harvested area (Table 2). In Vietnam some irrigated rice fields have been constructed also on terraces on mountain slopes such that in Hoang Su Phi in Ha Giang Province, Mu Cang Chai in Yen Bai Province, and Sapa in Lao Cai Province. There were also irrigated rice fields with high soil organic matter content at the base of hills in Northern Mountains and Midland Region. In the past, some irrigated rice fields in the Red River Delta were in very low lying areas, were deeply flooded during rainy season and they were planted with Chiem rice at the end of rainy season in November/December. 2.4 Deep Water/Floating Rice Fields: In Vietnamese deep water/floating rice fields are ruộng lúa bị ngập sâu hay lúa nổi. Before the construction of Hoa Binh Dam, a large number of rice fields in the Red River Delta were subjected to deep flood during rainy season yearly. In Mekong River Delta, majority of rice areas in Châu Đốc, Tứ Giác Long Xuyên, and Đồng Tháp Mười were subjected to deep flood in September and October yearly. The flooded water layer in Châu Đốc reaches to 2 to 4 metres and that in Long Xuyên reaches to 1 to 2 metres (Nguyen Van Luat, 1994). Gupta and O’Toole in 1984 and Huke and Huke in 1997 reported that the total harvested area of floating rice in Mekong River Delta was about 400,000 to 410,000 hectares. However, also in 1997, Ohta et al. Reported about 500,000 hectares of floating rice in the Mekong River Delta. The area of floating rice in Mekong River Delta has been greatly reduced by the construction of irrigated and drainage canals after 1975 (Yasuyaki 2001 and UNEP 2005). 2.5 Tidal Wetland Rice Fields: In Vietnamese tidal wetland rice fields are ruộng lúa bị ảnh hưởng của thủy triều. The tidal wetland rice fields are found in coastal areas or along the rivers that are influenced by invasion of tidal water. Soils of rice field usually are salted by tidal water. In 1988, FAO reported that there were more than 1 million hectares of rice fields in Vietnam has salted soil, of which (a) 650,000 hectares were in Mekong River Delta; (b) 350,000 hectares were in Red River Delta; and (c) several hundred thousand hectares were in Central Coastal Area. In the very early days of the history when there was no irrigation facility the rice crops were either upland rice or rainfed lowland rice and rice was planted only once a year. The rainy season in most parts of Vietnam is from April/May to October/November, but with limited available tools for land preparation and planting, Vietnamese farmers had to start to prepare the land early in February (or tháng Giêng in Vietnamese calendar) and then plant/seed the rice crop in March (or tháng Hai in Vietnamese calendar) before the arrival of rainy season. After the arrival of rainy season in April/May, rice seeds germinate and then rice crop grows, develops, flowers and then rice grain ripe in October. Farmers then harvested the ripen rice grains in November (or tháng Mười in Vietnamese calendar) and this it was described in the following folk song or Ca Dao. With improved technologies and knowledge, however, Vietnam rice farmers have gradually increased the number of rice cropping seasons in a year. During the period from probably the 10th century to 19th century, there were the following rice seasons in Vietnam: Lúa Mùa, Lúa Chiêm, Lúa Ba Trăng, and Lúa Tháng Tám. The following Ca Dao indicates the different rice crops and rice types in Vietnam in the 19th century or before. 1.1 Lúa Mùa: Probably, Lúa Mùa had been the main rice crop in the country up to 1960. This cropping season takes place during the rainy season and rice crops were planted in June and harvested in November. This rice cropping season was also called Lúa Tháng Mười as the harvest took place in November (or Tháng Mười in Vietnamese calendar). In the present-day, Lúa Mùa is still planted in all regions of the country. The following folk song describes the activities of Lúa Mùa in the past. 1.2 Lúa Chiêm: Starting under the reign of King Lý Thái Tổ (1009-1028), the drought tolerance rice varieties from Champa kingdom were introduced and planted at the end of rainy, usually in December, in areas which were lying in very low areas in the Red River Delta and other deltas in Thanh Hóa and Nghệ An Provinces, which were deeply flooded during rainy season. This rice crops were harvested in June. This Lúa Chiêm rice was also called Lúa Tháng Năm, as it ended in June (or Tháng Năm in Vietnamese calendar). However, there is no reported harvested area for Lúa Chiêm in the recent years. 1.3 Lúa Ba Trăng: After the marriage of Princess Huyền Trân to Champa King in 13th century, a generation of Champa’s very early maturing rice varieties were adopted for planting in areas from Quảng Bình to Thừa Thiên-Huế Provinces. Rice crops were planted in December and harvested in March or after 3 months (or Ba Trăng in Vietnamese). In recent years, there is no report on harvested area of Lúa Ba Trăng. 1.4 Lúa Tháng Tám: With new irrigation facilities, which were resulted from the policy of Lord Nguyễn Phúc Tần (1648–1687), farmers in South Central Coastal Region, Southeast Region, and Mekong River Delta started to practice a new rice cropping season – the Lúa Tháng Tám, which was planted in April and harvested in September (or Tháng Tám in Vietnamese calendar) (Bùi Huy Đáp, 1985). The Lúa Tháng Tám was later widely adopted in Mekong River Delta in order to avoid flood damages that take place annually during the period from September to November. However, in recent years, there is no reported harvested area for Lúa Tháng Tám. Since 1976, Lúa Mùa, Lúa Hè Thu and Lúa Đông Xuân have been the main rice cropping seasons in the country. In 1976, the total harvested area of Lúa Mùa, Lúa Hè Thu and Lúa Đông Xuân crops was about 5.3 million hectares (Table 3). 2.1 Lúa Mùa: This rice cropping season continued from the 20th century as describe in section 1.1 above. In 1976, the harvest area from Lúa Mùa was greatest or about 3.29 million hectares, but it has decreased consistently to about 2.18 million hectares or the lowest harvested area in 2002 (Table 3). 2.2 Lúa Đông Xuân: Lúa Đông Xuân is generally irrigated. In Red River Delta, it was established from December to February and harvested in June. In Central Coastal Regions and Southeast Region, Lúa Đông Xuân is planted during October to December and harvested in March and April, while in Mekong River Delta Lúa Đông Xuân is planted in November and harvested also in March to April. The harvested area of Lúa Đông Xuân increased from about 1.39 million hectares in 1976 to about 3.03 million hectares in 2002 and it has become the principal rice cropping season in the country in the recent years and with a largest annual harvested area (Table 3). 2.3 Lúa Hè Thu: The former rice cropping season Lúa Tháng Tám is popularly called Lúa Hè Thu in the present days. In Central Coastal Regions, Lúa Hè Thu are established in April and May and harvested in August and September, while in Mekong River Delta it is established in April and harvested in August and September. The harvested area of Lúa Hè Thu increased from about 0.61 million hectares in 1976 to about 2.29 million hectares in 2002 (Table 3). The practices of farmers in carrying out the three rice cropping seasons per year (namely Đông-Xuân, Hè-Thu, and Mùa) have resulted in the situation that rice harvest is being carried out in all months in a year in the country. Table 4 shows that in 2000, the quantity of rice harvested in March was highest, which was followed by that in July. At regional level, the peak of rice harvest, however, varies from region to region in the country (Table 4). FAO 1988 Report of the mission on Vietnam agricultural sector review.